With a rolling backdrop of Worcestershire’s green fields, the 2016 outdoor festival season kicked off in the beautiful setting of the Jinney Ring Craft Centre’s grounds. It was a low key beginning, illuminated by the scheduling of two acclaimed artists appearing with the sure fire guarantee of impressing in terms of their talented versatility. Sam Carter and Lucy Ward duly confirmed their high profile billing to top a day where the weather gods eventually decided to show a little mercy on the folk fans gathering for this quaint festival. Although organised as a two day event for the camping fraternity, the music was essentially confined to the Saturday with eight acts booked to frequent the single tented stage from noon till late. The majority of these represented the local scene within the county, covering several bases of a loosely defined folk genre. A few thoughts on those which created the most impression a bit later, but the first kind words need to be reserved for Lucy Ward who continues to show why discerning folk critics are right on the mark. 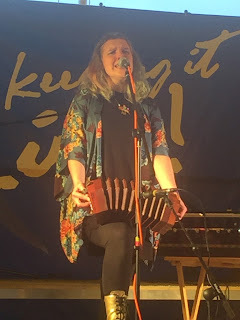 For an hour as the sun set (it was a pity the two main acts weren’t allotted a little more time), Lucy gave another enchanting performance packed with feisty impassioned chat and bags of wonderful artistic invention. Whether accompanied by guitar, concertina or harmonium, the songs bristled with an enriched substance showcasing the aura that Lucy purveys as a solo artist. The challenge is not to shed a tear for the plight of Bobby Barker in ‘Lion’ or not to be inspired by the passion of her conviction for change in ‘Bigger Than That’ and the requested ‘For the Dead Men’. A touch of on-stage eccentricity goes a long way to defining the magnetic charm of Lucy especially starting her set with visions of the end of the world in ‘The Last Pirouette’. The shade lightened considerably with a ratchetted down version of ‘Waterloo’ in honour of Lucy’s Eurovision obsession. 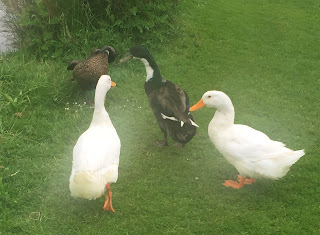 Not to be outdone on celebrating the folk tradition, ‘Old Brown Hen’ and ‘King Willie’ were gustily sung thus showcasing the vocal versatility of this Derby-based singer-song writer – interpreter- multi instrumental musician. Lucy’s energy, vibrancy and enthusiasm shine through her songs and if there’s a vocal vacancy to lead the song protest movement then a nominator and seconder won’t be difficult to find. 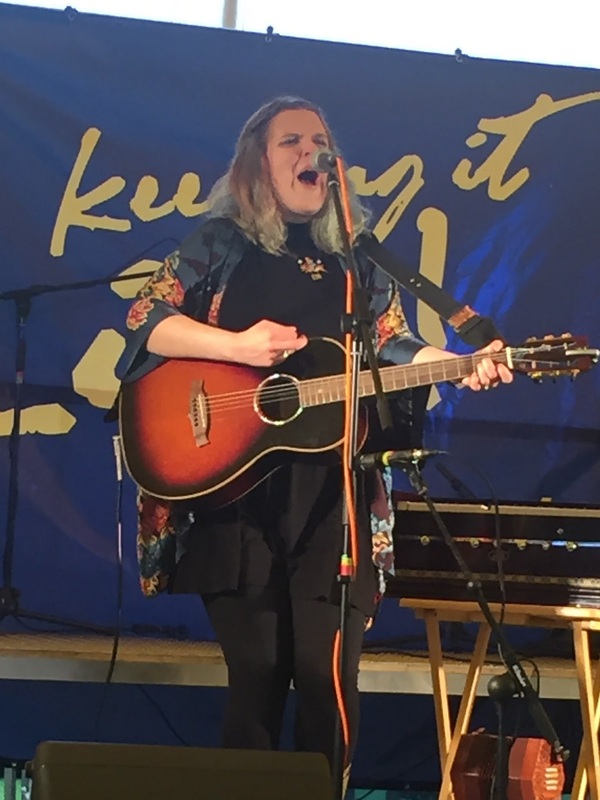 If personality and all-round aura play a significant part in Lucy Ward the performer, Sam Carter finds the optimum balance of matching the folk song ideal with the power of the electric guitar. To be fair Sam does excel when armed with the acoustic variety as well, but there is something special when he ventures down the folk rock road. A journey which continues to accumulate praise especially with the Richard Thompson connection and the False Lights project. In contrast to Lucy, Sam has a brand new album just released and this evening’s performance brought by the Sam Carter Trio yielded several tracks from HOW THE CITY SINGS. Differences between the two were the extent of inter song dialogue, although commissioned song writing is a common theme. This was also extended to the content and desire for more justice in this world. Perhaps the defining mark of Sam’s, also too short, hour on stage was the band musical interaction featuring the trio completed by Evan Jenkins on drums and Matt Ridley on both electric and stand-up bass. They played a sensitive subtle role supporting Sam’s slower numbers before considerably stepping up when the signal came to ramp up the rock vibes. 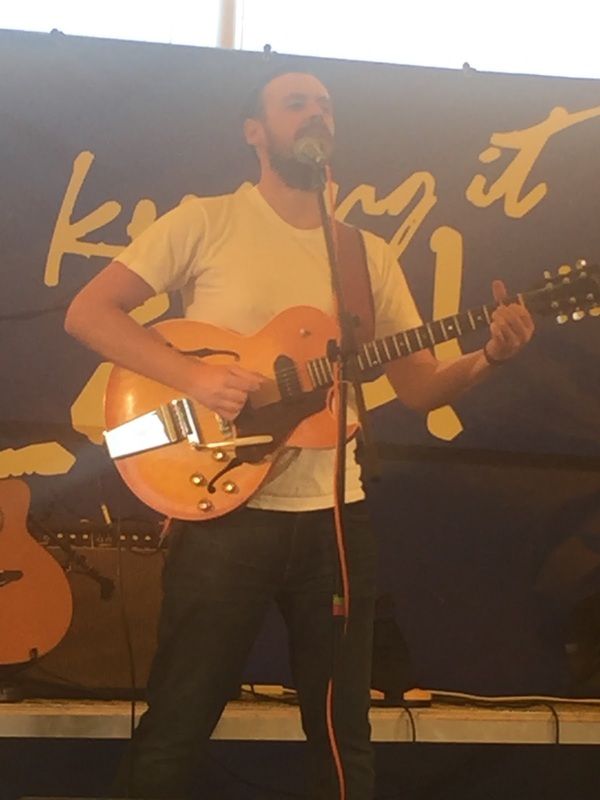 This guitar exhibition injected a renewed life into a festival as the afternoon gave way to the evening session. Despite Sam and Lucy being the heavy bias subjects of this feature, the remainder of the festival programme was not short of merit in its own way. 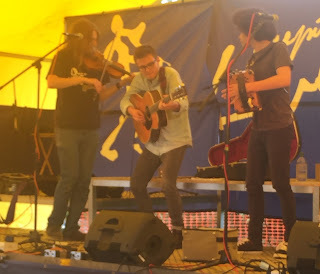 Unfortunately the first two acts were not witnessed due to prior commitments, but upon arrival interest was instantly aroused by the performance of folk-punk duo Jack of All. In line with much of the day’s content, protest music was in plentiful supply as this guitar-fiddle duo possessed all the excitement of the 80s heyday when The Levellers and New Model Army spearheaded an alternative take on some of society’s conventions. The moral though is the relevance then is just as high, if not more so, thirty years on. Worcester-based trio Granny’s Attic was probably the pick of the four lower key acts seen. 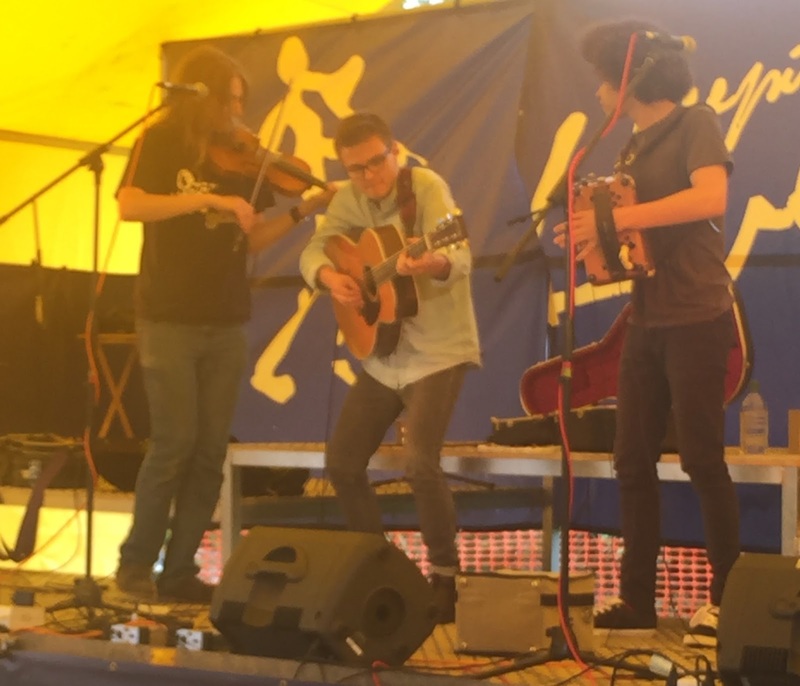 Consisting of fiddle, guitar and melodeon, the trio’s sound belied the combined age of their young years as they lent heavily on the traditional strands of Irish, Scottish and English folk. The shared vocal arrangements were the perfect match for a batch of original and traditional songs. The guys certainly maximised every minute from their hour on stage and the performance suggested that they will not be short of festival bookings this summer season. The two remaining artists were full bands with contrasting sounds thus adding to the diverse feel to this musician assembly. Woo Town Hillbillies concluded the afternoon session with a fun set of American inspired folk songs drawing on old time, bluegrass and country influences. To bring the festival to a close, indie pop rock band Jasper in the Company of Others was the perfect tonic for those wishing to end the day in upbeat mode on their feet. All the artists played their part in making the musical presentation a success and create interest that this mini jamboree could be repeated next year. While Sam Carter and Lucy Ward were the undoubted stars of this show, even they had to play second fiddle at times to the large presence of ducks from the nearby pond. Maybe there were more edible attractions for our feathered friends than the music that filled the air for nearly twelve hours. On a final note the organisers deserve praise for their excellent offering of food and drink as well as ensuring the sound from the stage was top notch. The booking of Sam and Lucy was a venture that successfully paid off as well.